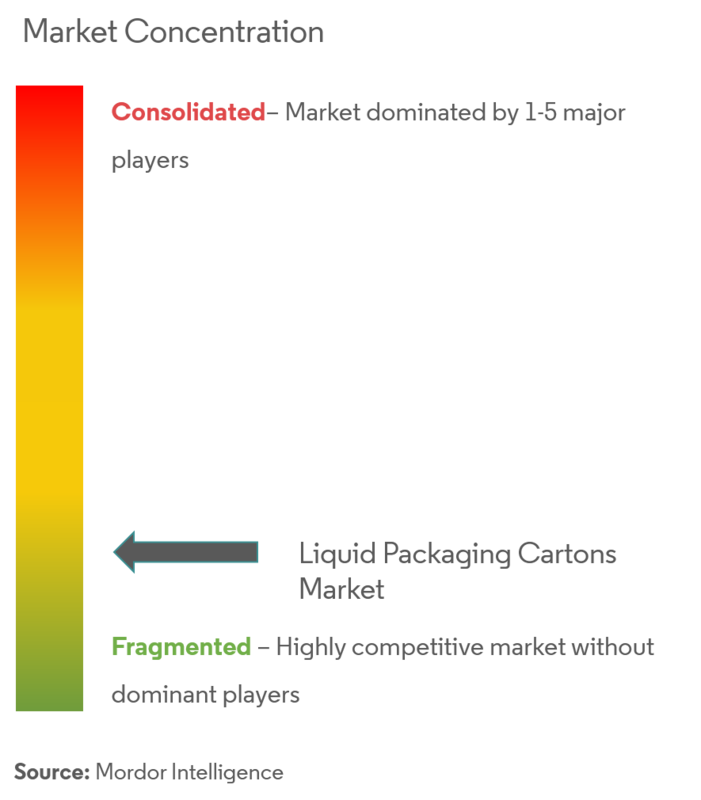 The liquid packaging cartons market is segmented by Liquid Type (Milk, Water, Juices, Energy Drinks, Alcoholic Beverages) and Geography. The liquid packaging carton market was valued at USD 9.73 billion in 2018 and is expected to reach a value of USD 11.65 billion by 2024, with a CAGR of 3.06 % over the forecast period (2019 - 2024). The liquid packaging carton market is having steady growth compared to other packaging products available like plastics and glass packaging. Increase in disposable income is one of the major factor contributing to the growth of this industry. The liquid packaging cartons are primarily utilized for dairy products, soft drinks, and water catering in diverse shapes and sizes to various consumers. 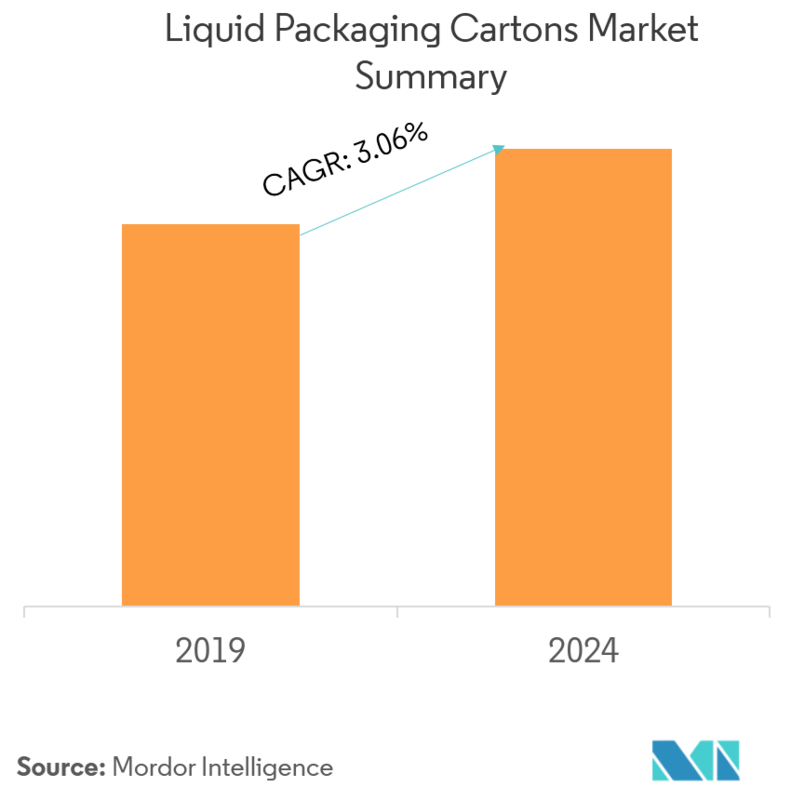 The rising preference for easy-to-carry liquid foods is expected to boost the demand for these packaging cartons, thereby, fueling market growth. The changing lifestyle of people coupled with the convenience of utilizing carton packaging is projected to propel the market. On the flip side availability of substitutes like glass and plastic products are hampering the growth of this market. The cost of producing plastics are comparatively low and they also require less energy consumption while manufacturing them. Nevertheles, liquid packaging cartons have an edge over the glass and plastic packaging, in terms of environmental-friendliness and recyclability of the material, which mitigates the wastage and reduces the product cost. In November 2018, Zumosol in Spain partnered with Elopak and switched from plastic bottles to sustainable beverage cartons. They found the new carton packaging to be more natural and sustainable fit for its organic portfolio. This also resulted in reduced carbon footprint and reduced weight, which provided a naturally different, sustainable and authentic package. Liquid packaging cartons are containers, which enable safe transportation and storage of liquid products and provide customized packaging based on the marketing requirements of manufacturers. The food and beverage sector captures the major share for this industry. North America is having the largest market as people in the region have witnessed a fast lifestyle making them prefer ready-to-eat food. According to the Food and Agriculture Organization of the United Nations, dairy products demand in developed and developing countries has been increasing for past few years. As population and income increases, and diets become more globalized, dairy products are expected to be consumed specifically in developing countries. The wordwide demand for processed milk and juices has also increased over the recent years. While processed milk and dairy products have played a significant role in shaping the liquid packaging cartons industry particulalrly in the North American region, the growing demand for fruit juice worldwide, which rose to 35 billion liters in 2017 has alos been crucial to the market growth. As people are becoming aware of the benefits of carton packaging, they are shifting from other packaging materials towards paperboard containers. 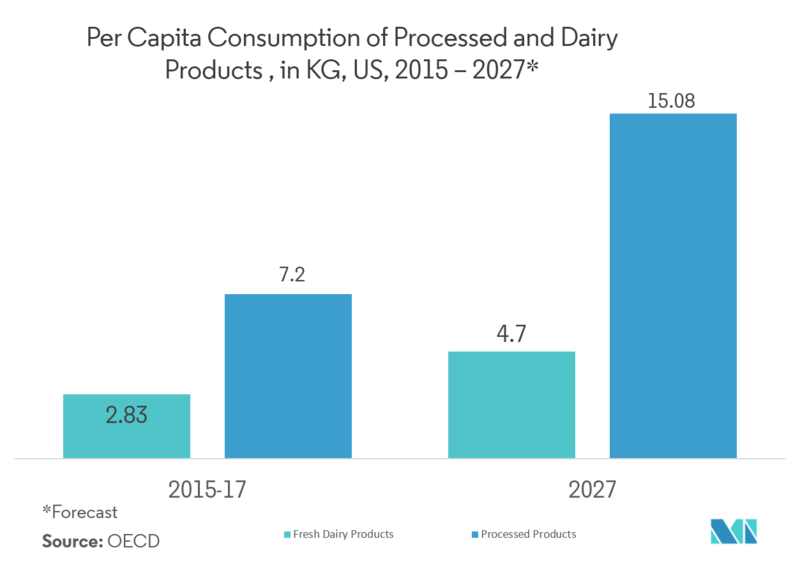 In the United States, milk solids will see tremendous growth and this will supplement the liquid packaging carton market. Asia-Pacific to witness the Fastest Growth during the Forecast Period. 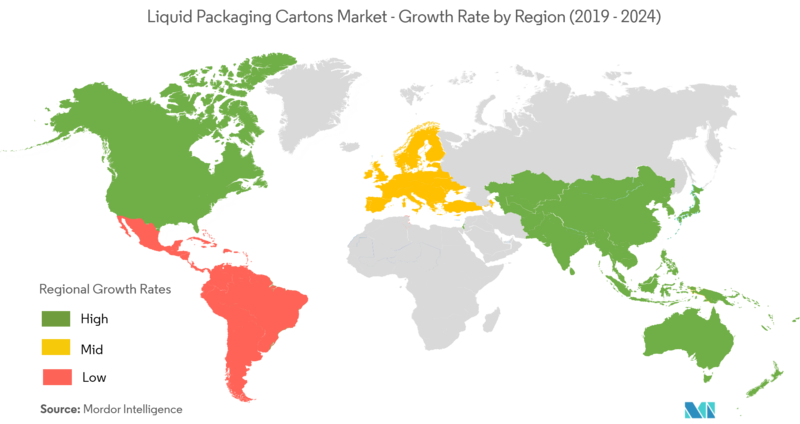 Asia-Pacific is dominated by the population of China and India and in these two countries, the increase in disposable income and a constantly growing rate of these countries will act as a supplement for the growth of the liquid packaging carton market. According to the Food and Agriculture Organization of the United Nations, India and Pakistan will contribute the maximum production of milk in the upcoming years. India is the developing nation and the increase in the paper cardboard has been observed on account of factors such as increasing FMCG and food & beverage sector. This is being supported by the Government of India as well because the Plastic carry bags are banned in India. This movement has acted as the stimulator for the majority of the people in India. The global liquid packaging is quite fragmented because of the presence of large players like Elopak, Evergreen Packaging LLC, etc and local players in this industry. Moreover, the rising partnerships and mergers and acquisitions are predicted to supplement the market growth for this industry in the upcoming years. The growing environmental concerns like overutilization of plastic packaging, recyclable nature of carton packs, and convenience over the use of glass packaging are some of the factors that will help in boosting the liquid packaging industry. Innovations in liquid packaging like the use of recycled paper, lightweight packaging are the drivers for this industry. March 2019 - Tetra Pak, planned to be the supplier of full-color digital printing on its carton packages, by collaborating with Koenig & Bauer. This will offer the brands to continue to look for opportunities to deliver greater customization and personalization of their products in the while placing their orders.